March | 2014 | Watanabe Floral Inc. 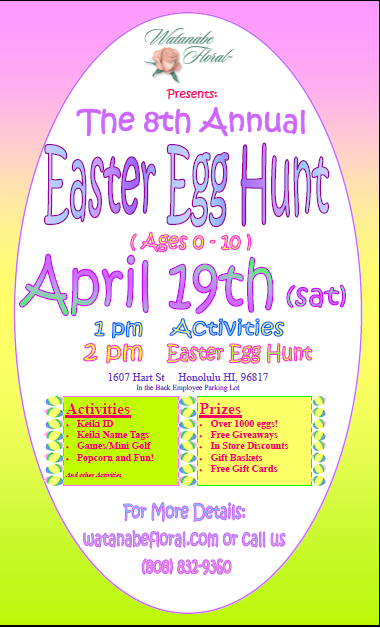 Please join us for our 8th annual Easter Egg Hunt! Tulip (general) – Gift from a perfect lover. Love. Tulip (red) – Irresistible love. Believe me. Declaration of love. Tulip (yellow) – Hopeless love. Keep up to date with our events, promotions, and discounts by following us on social media! Part of the reward of being in the Flower business is “helping others to express their feelings through flowers”. This company motto began with Ernest Watanabe who, returning home from WWII, recognized that there would be a lot of soldiers and families of soldiers wanting to express their feelings and, perhaps, needed a way to be able to do that. We continue that pledge today. We know there are plenty of times in life that expressing feelings is maybe hard to do. And maybe a little flower can say it better than words. The other day we received a call from a concerned father of a little girl named Anaiah. 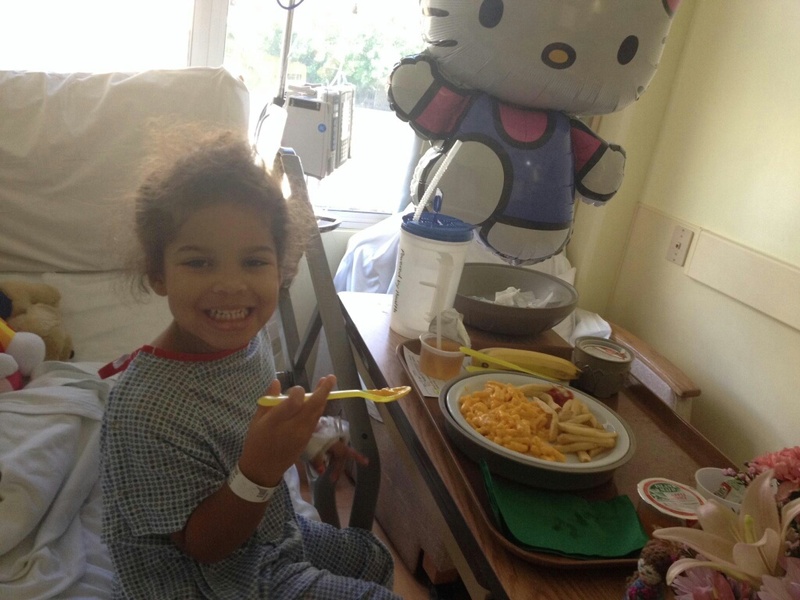 Anaiah, 4 years old, was in the hospital. The Father was away on the mainland and couldn’t be there with his daughter who was very ill and, as a result, not eating. He wanted to send her something special that would let her know that he loved her, wanted her to feel better, and wished he could be there with her. He decided on a lavender and pink basket arrangement, a Hello Kitty plush, and since the little girl loved Hello Kitty so much, we tacked on a Hello Kitty balloon for free. Later, we received a call from the same Father. He reported that the gifts had arrived, and that upon receiving them, Anaiah lit up and could not stop smiling. He said she was so happy that she even started to eat. It is truly our honor and privilege to assist in creating these happy feelings. 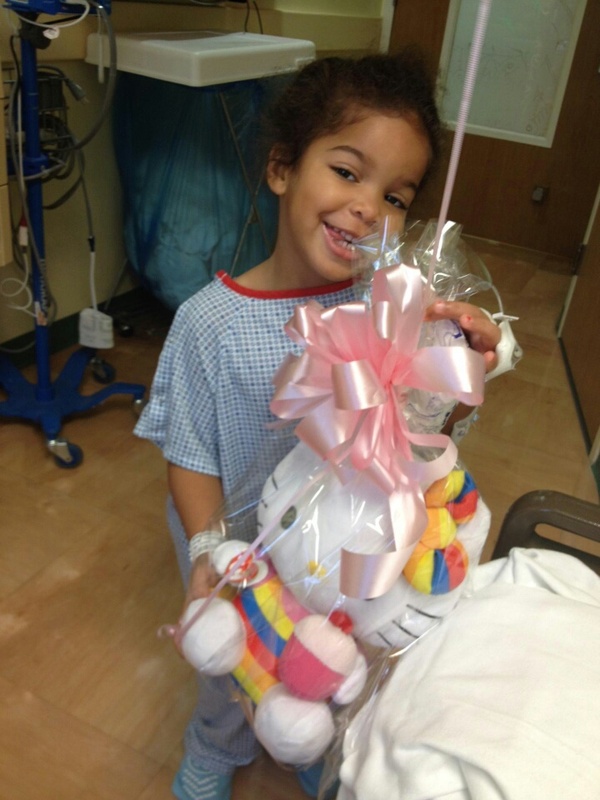 Get well soon, Anaiah!